I hope all of you are having a wonderful week so far! 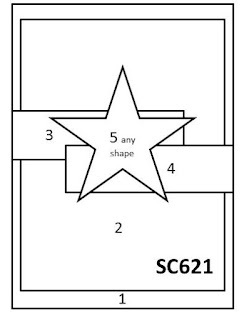 It’s time for the new Splitcoaststampers’ SC621Sketch Challenge and I just love the sketch that Diane designed for us this week! I decided to create a Clean and Simple (CAS) Christmas card with the retired Stampin’ Up! 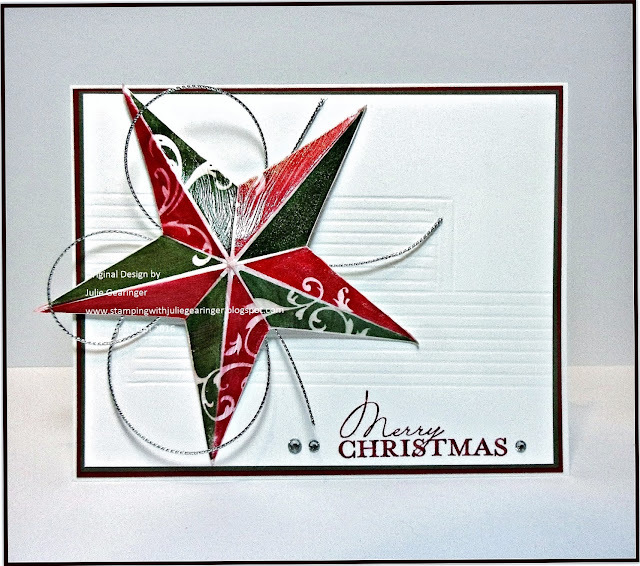 Christmas Star (Holiday Single) stamp along with a sentiment from the retired Contempo stamp set. I am also linking this card to the Hand Stamped Sentiments HSS252 Inspiration Challenge (I was inspired by the reds and greens as well as the white) along with the Time Out #71 “Christmas with an Optional Twist of Glitter/Shimmer” Challenge. If you have not already visited the above challenge sites yet, I hope you will have a chance to do so- fabulous inspiration from my DT Sisters at the SCS Sketch Gallery as well as the other challenge sites! 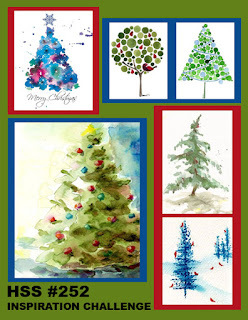 Using Stampin’ Write Markers (Cherry Cobbler and Always Artichoke), color the retired Stampin’ Up! Christmas Star image, “huff” onto the ink to re-moisten and stamp onto a piece of Whisper White cardstock. 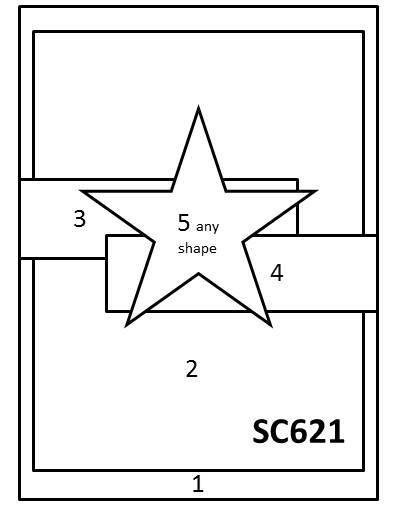 Fussy-cut the image and use the Simply Scored™ Tool to score all of the lines. Fold the score lines to create the dimension and use a foam brush to apply ModPodge® to the image (be careful not to press too hard since the ink will start to run together and set it aside to dry). 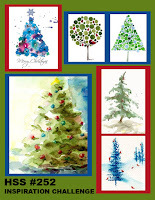 FYI- I like to apply ModPodge® at times to images to give them more stability and it does have shimmer :-). Use the Simply Scored™ Tool to add scoring to create the “side panel” elements of the sketch, trim the panel, mount onto Always Artichoke cardstock, trim again and mount onto Cherry Cobbler Cardstock. Use Clear Wink of Stella® to add shimmer to the scored areas (difficult to see in the photo). Use the Cherry Cobbler Stampin’ Write Marker Ink to ink the sentiment from the retired Contempo Christmas stamp set and stamp onto the card front. Mount the entire card front onto the white card base, add the looped retired Silver Cord and mount the Christmas Star image with dimensional foam. Thanks again for taking the time to visit- I hope you can gather your supplies and join us for the SC621 Sketch Challenge at Splitcoaststampers this week! What a beautiful star! And those line gve real depth on your card. Thank you for joining us at TIME OUT! What an interesting sketch. Your interpretation is amazing!. Your clean and simple design let's the Christmas star really shine! I wish the wink of Stella would show up better in the photo. I bet it gorgeous in real life! Thanks for playing along with us at Hand Stamped Sentiments! Wow this card is stunning! I love your creative scoring and may be CASEing this idea. So glad you joined us for our challenge and hope you will play with us again on our next challenge. What a beautiful card. Your star is stunning. Thanks so much for playing along at Time Out. This is beautiful! I love the scoring behind the beautiful star! Thanks for playing along at HSS! I love you were inspired by the star in our inspiration challenge. Great idea to make the store red and green and I love the scoring behind the star. Thanks for playing at Hand Stamped Sentiments.